Synapse was hired by a coalition of community groups and environmental advocates to provide guidance on potential reuse options for the site. We found that the location and the existing transmission infrastructure make the site ideal for a Clean Energy Hub that combines solar, energy storage, an interconnection point for offshore wind, and a food waste digester. And while some would like to see a large new natural gas plant like the one being constructed in Salem replace Brayton Point, there is no immediate need—and certainly no overwhelming benefit—to rush into building such a project. We have plenty of power without Brayton Point. New England’s Independent System Operator, which runs our regional electricity grid, ensures that we’ll have enough electricity to keep the lights on without Brayton Point. Somerset’s electricity comes from all over New England, and the region has more than enough capacity to meet the needs of consumers. 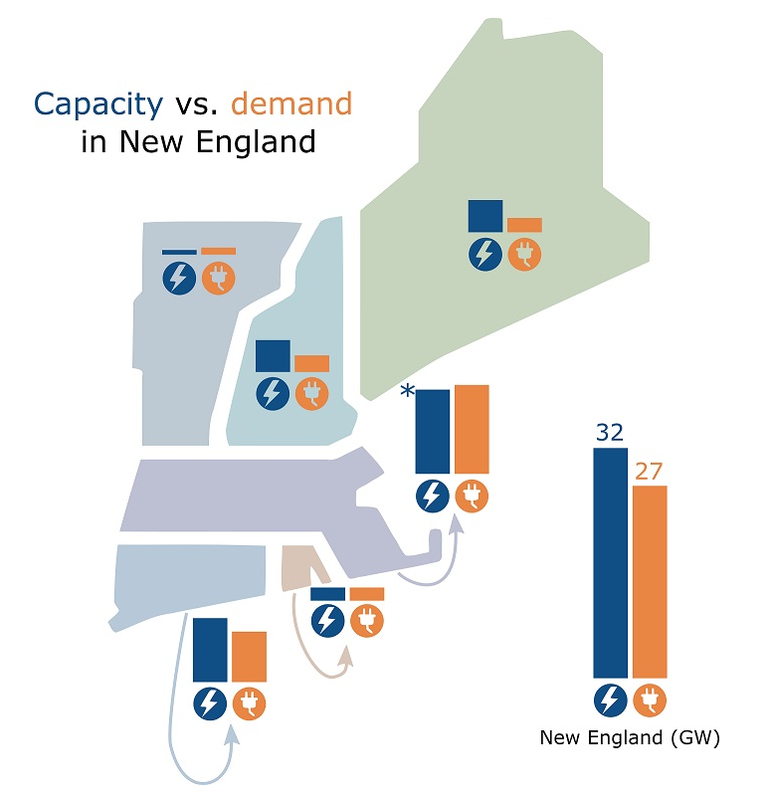 The map to the right shows the region’s extensive electricity transmission grid, while the figure below it shows New England’s total electric capacity compared to peak demand (i.e., how much is needed on hot summer days when air conditioners run at full blast). Even with the loss of Pilgrim Nuclear Station in Plymouth, Somerset and the greater New England region will have more than enough capacity to keep the lights on for years to come. More fossil fuel won’t necessarily replace the revenues from Brayton Point. The Brayton Point power plant used to pay substantial property taxes to the Somerset community, but these payments have been decreasing for years. In line with current trends, new natural gas power plants in other areas are negotiating payments in lieu of taxes (PILOT) that would represent only a fraction of the earlier Brayton Point revenues. A diverse set of resources on the site would offer an array of revenue options that would not be at risk of disappearing suddenly with the closure of a single plant. In fact, the developer of the proposed Deepwater Wind offshore wind project has stated it would likely make significant PILOT payments to the communities where its energy comes onshore. More fossil fuels could hinder Massachusetts’s climate protection goals. A new natural gas plant at Brayton Point would use up 3 to 7 percent of Massachusetts’ expected electric-sector emissions in 2020, and would, by themselves, exceed allowed emissions in 2050. Developers of the new gas plant in Salem had to commit to closing that plant by 2050 so that Massachusetts could comply with its Global Warming Solutions Act. Even with this commitment, there are several other new gas-fired facilities proposed in the area, and a new plant at Brayton Point would make it much more difficult for the state to meet its climate goals. 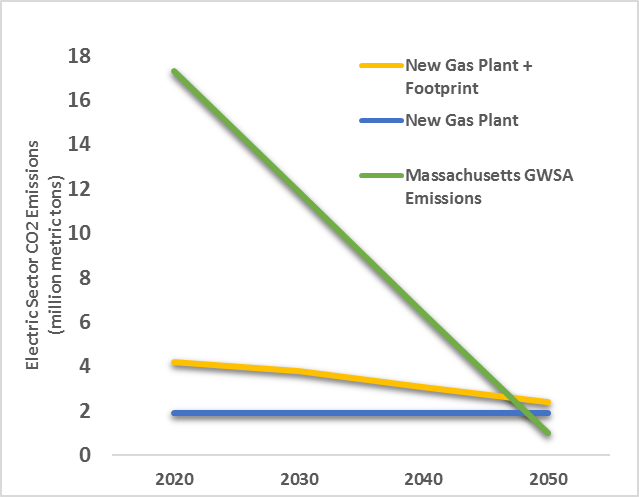 The figure above shows how many emissions might come from a super-efficient new gas plant (the blue line), from a new gas plant plus the under-construction gas plant in Salem (yellow line), and how many emissions the electric sector is expected to have over the next 30 years (green line). Local renewable energy keeps dollars in the local economy. Clean energy investments tend to stay within the local community. New installations often involve local contractors, who re-spend wages within the region. A switch to clean energy resources can have the effect of recapturing the dollars that, under fossil fuel-based operations, left the state in the form of payments for fuel and equipment. In a recent study we did for Montana, we found that, overall, renewable electricity generation creates more local jobs than fossil fuel-based electricity generation on a per megawatt basis. As the Somerset community works with the state and the Brayton Point property owners to determine the best option for reusing the site, they will be carefully considering the future they wish to see for this 234-acre waterfront property. Alternative options such as the Clean Energy Hub scenario show a vision of the future that would allow for the restoration of some of the town’s tax revenues, provide clean, reliable electricity for the region, provide jobs and help advance technological innovation, and reduce pollution and other industrial burdens on the town’s waterfront and surrounding communities.